Home » Desserts » How to Make Toasted Coconut. How to Make Toasted Coconut. Learn to make toasted coconut with this easy tutorial. 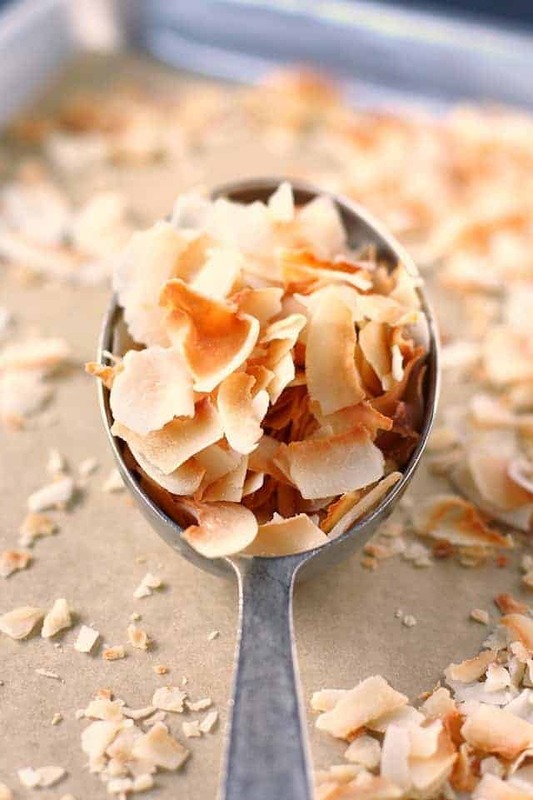 These coconut flakes are a delicious addition to your desserts or breakfast foods. Toasted coconut is such a delicious treat, isn’t it? I love to make a batch of coconut granola where the coconut gets all golden brown and toasty. Or a nice warm coconut cookie – that’s a yummy sweet to enjoy with a cup of tea. It’s really easy to toast coconut flakes yourself – you just need some unsweetened coconut and an oven! How do you make toasted coconut? Place unsweetened coconut flakes on a cookie sheet that’s been lined with parchment paper. Bake at 325 degrees for about 5-7 minutes, or until golden, stirring once to ensure even baking. Allow the toasted coconut to cool before using. How do you store toasted coconut? Store these coconut flakes in an airtight container such as a glass jar. They should stay fresh for about a month. 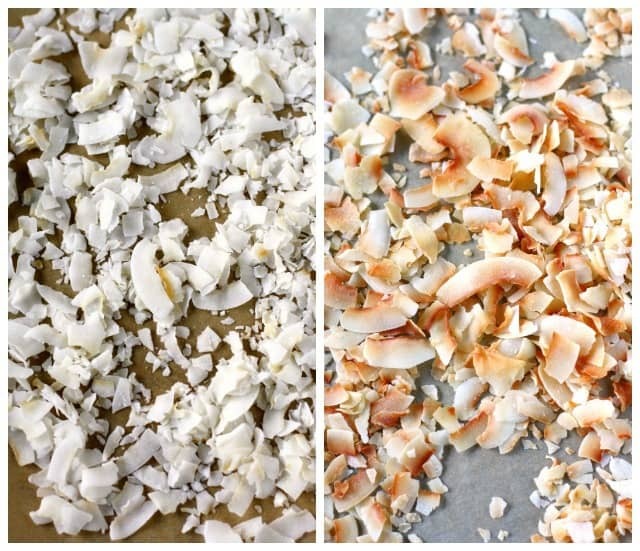 Should you toast large or small coconut flakes? Either will work well, but the finely shredded coconut will toast more quickly. Be sure to keep an eye on it. 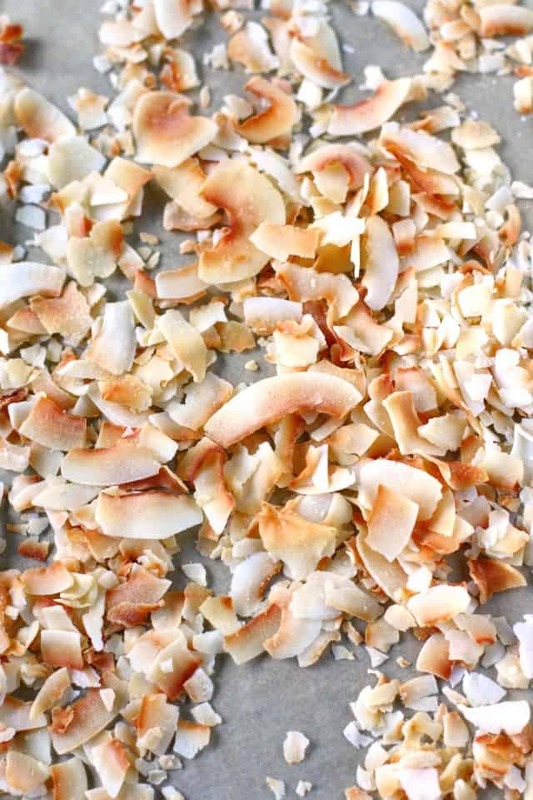 The larger coconut flakes have more of a crunch to them once they are roasted. Can you toast sweetened coconut flakes? 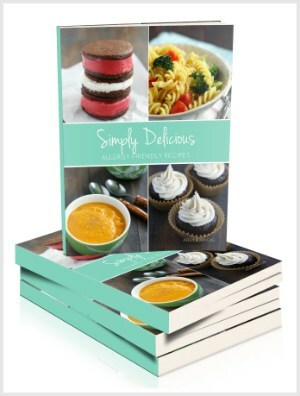 Yes, you can, but they will cook even more quickly due to the sugar. Stir often, and don’t walk away from the oven during baking. 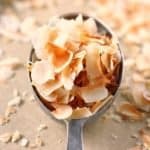 How do you use toasted coconut? There are many uses! 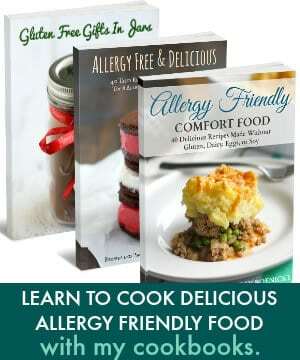 It’s wonderful in granola, energy bites, cookies, or sprinkled on top of ice cream. You can even make vegan coconut bacon, which is basically seasoned coconut that has been toasted. It's so easy to make toasted coconut flakes! 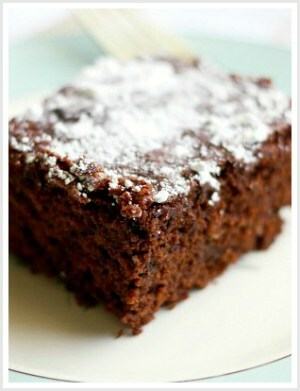 These are delicious on desserts and breakfast foods. Spread the coconut flakes evenly on the cookie sheet. Place in the oven. Bake at 325 degrees for about 5-8 minutes, stirring to ensure even baking. Remove from the oven when the coconut is fragrant and lightly golden brown. You can use large or small coconut flakes. If you use finely shredded coconut, keep a close eye on the oven - it will be done very quickly. Store toasted coconut in an airtight container for up to one month. If you love coconut, you may also want to try these nut free Lara bars, or these chocolate coconut candy bites. « Pumpkin Chocolate Chip Cake.